Ever has created an amazing product with their cellular renewal oil ($88) This is meant to fight the signs of aging for firmer, tighter and more toned looking skin. Retinol is the #1 age fighting product when it comes to growing older and wrinkles. 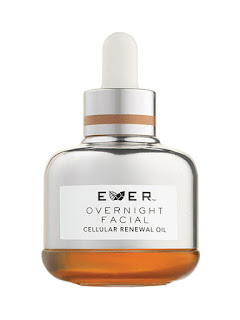 Ever Overnight Cellular Renewal Oil takes Retinol and a clinically proven tetrapeptide and combines them with anti aging super strength for dramatic skin results. REGENERATE: Retinol is clinically proven to firm and even skin tone, reduce the appearance of fine lines and wrinkles, and help decrease the appearance of pores. FIRM: Tetrapeptide is one of the most effective, clinically proven peptides available, and helps diminish the look of fine lines and wrinkles while lifting and firming to help lift the years off. FIGHT FREE RADICALS: Teprenone is a cell protector that is clinically proven to help reduce the top 10 visible signs of aging. Overall I love the results on my face. In the morning my skin feels soft and doesn't feel rough or dry. (Which it usually does when I wake up) After using it for 2 weeks straight I see a significant difference in my skintone and overall texture of the skin on my face. Now the product only says use THREE times a week and I was using it every night, so I'm not sure what difference that made or not. I'm sure you would probably get the same results using it as directed, I just tend to overuse my beauty products. Ever Overnight Facial Oil is available for $88 on their website for $88. You can find them on Facebook and Twitter too! That looks like a wonderful product. Amazing article. Its very interesting and informative. I had some question about vampire facial.